Win lunch with Marcus Butler! That's right. Just you and Marcus chatting over lunch. Best friends forever. Pre-order Hello Life! (9781472230072) to be in with a chance of winning lunch with Marcus Butler! So, if you want to be in with a chance to meet Marcus, all you have to do is preorder Hello Life! More details about the competition, including full terms and conditions, can be found below. Good luck! Due to Marcus’s busy schedule the date of the meet and greet will be confirmed with the winner once the competition has ended, reasonable means will be used to find a date suitable for both parties but if the winner is unable to make the dates and times offered, or otherwise declines the Prize, the prize will be passed onto another entrant. The prize will be fulfilled by September 2015. Transport costs of up to £50 for both the prize winner and their guest will be provided to help cover mainland UK travel. Proof of transport cost must be provided for reimbursement. Please note accommodation is not included. Once agreed, details of the exact time and date of the meet and greet are to remain strictly confidential until after the meet and greet has taken place. Any unauthorised sharing of the date and time of the prize will result in the cancellation of the Prize. 1. These terms and conditions apply to the competition titled Hello Life! Competition. No purchase is necessary. 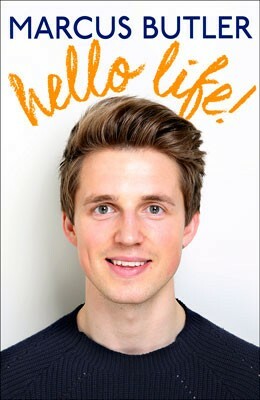 Any Waterstones.com customer who pre-orders a copy of Hello Life! (9781472230072) by Marcus Butler (ISBN Number 9781472230072) (the “Title”) before midnight on 29 July 2015 will be automatically entered into the competition unless they opt out. Only one entry per person is allowed notwithstanding second or subsequent purchases of the Title. 2. Entrants must be residents of the UK. Any successful entrants under the age of 18 must provide the written consent of his or her parent or guardian to be received by the Promoter in advance of receiving the Prize. This competition is not open to employees or contractors of the Promoter or their immediate families, nor to any other person connected with the competition. 3. There will be one competition winner, chosen at random from all competition entrants who will win the following prize (“Prize”): an exclusive, money-can’t-buy opportunity to have lunch with Marcus Butler in a secret location in London. The date of the meeting with Marcus Butler will be confirmed with the winner once the competition has ended. Reasonable efforts will be used to find a date suitable for both parties but if the winner is unable to make the dates and times offered, or otherwise declines the Prize, the Prize will be passed onto another entrant chosen at random. The Prize will be fulfilled by the last day of September 2015. Transport costs of up to £50 for each of the Prize winner and their guest will be provided to help cover mainland UK travel. Proof of transport cost must be provided for reimbursement. Please note accommodation is not included. 4. The Prize is subject to availability. The Promoter reserves the right to amend the specification of the Prize or offer an alternative Prize of equivalent status. No cash alternative will be offered. The Prize is non-transferable. Once agreed, details of the exact time and date of the meeting with Marcus Butler are to remain strictly confidential until after the meeting has taken place. Any unauthorised sharing of the date and time of the Prize will result in the cancellation of the Prize. 5. Within 10 working days of 29 July 2015 the Promoter will select the winner at random from all entrants. The Prize winner will be notified by telephone or email, and will need to respond by midnight within one week of the date of contact. If a selected winner does not meet all of the necessary conditions or refuses the Prize, or, as noted above, cannot attend the meeting with Marcus Butler on the chosen date, another entrant will be selected from the remaining eligible entries at random. Unsuccessful entrants will not be contacted and no feedback on any entry will be provided. The decision of the Promoter on all matters is final. 6. By entering the competition, entrants consent to the use of their names, city of residence, photograph and/or image for publicity purposes in all media carried out by the Promoter (and in the case of there being more than one, each of them) without payment or compensation. 7. The Promoter may terminate, amend or withdraw this competition and/or these terms and conditions at any time. 8. You may enter the competition without pre-ordering the Title on Waterstones.com by sending to us, by first class post, a request to be entered (including contact details) to arrive before the stated deadline in paragraph 1 above. Our address is: Marcus Butler Competition, Waterstones Booksellers Ltd, 203-206 Piccadilly W1J 9HD. 9. For the name/county of the Prize winner, please send a stamped addressed envelope marked Marcus Butler Competition Winner to us at Waterstones Booksellers Ltd, 203-206 Piccadilly W1J 9HD. 10. Entry to the competition is conditional on acceptance of these terms and conditions, which are governed by English Law. By entering this competition you are deemed to have read and accepted these terms. Promoter: Waterstones Booksellers Limited (“Waterstones”) on behalf of itself and its associated companies in Ireland, The Netherlands and Belgium and Headline Publishing Group. A full-colour part-autobiography part-lifestyle guide by one of the world's biggest YouTubers.